The year we’ve spent with the Insignia has flown by. It seems like it’s just getting into its stride as it makes its way back to Vauxhall preparing for its second life as a used car. In that time the Insignia has provided almost 14,000 trouble-free miles, with fuel consumption that has seemed to improve away from the commute to a genuine 60-plus mpg. I know I’ve said it before, but it’s remarkable for a car this size and with its decent performance. 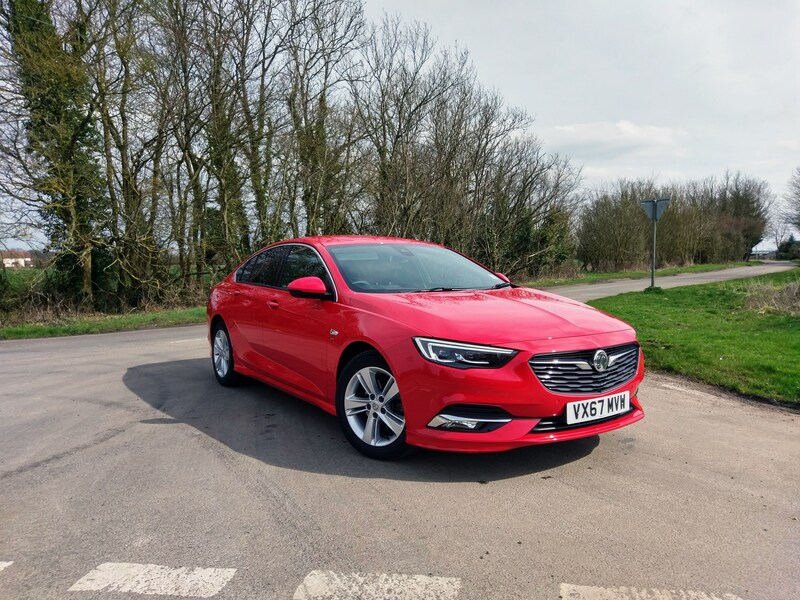 I remember during Fleet News Award judging earlier this year, although it didn’t take the win in its category (Vauxhall’s poor sales year in 2017 played its part), there was no end of praise for the Insignia’s capabilities. It makes so many things about the ownership experience easy, whether it’s steering into a parking space, preventing you from straying outside the lane marking and into danger, swallowing a load of luggage on the way to the airport, or spending the day pounding along the motorway. I was worried when I first tried this SRi VX-Line Nav that there was no lumbar support for the driver’s seat, but, in the end, it was never a problem. The seat comfort and support is as good as anything else available for the money. There are more wins than fails when it comes to ergonomics, too. The process of entering POI destinations in the navigation is a bit hit and miss, and the voice control functions are sometimes uncooperative. But the optional head up display has the easiest height adjustment of any on the market, and I loved the way the heated seat function monitors the outside temperature so that on cold days they are already on. 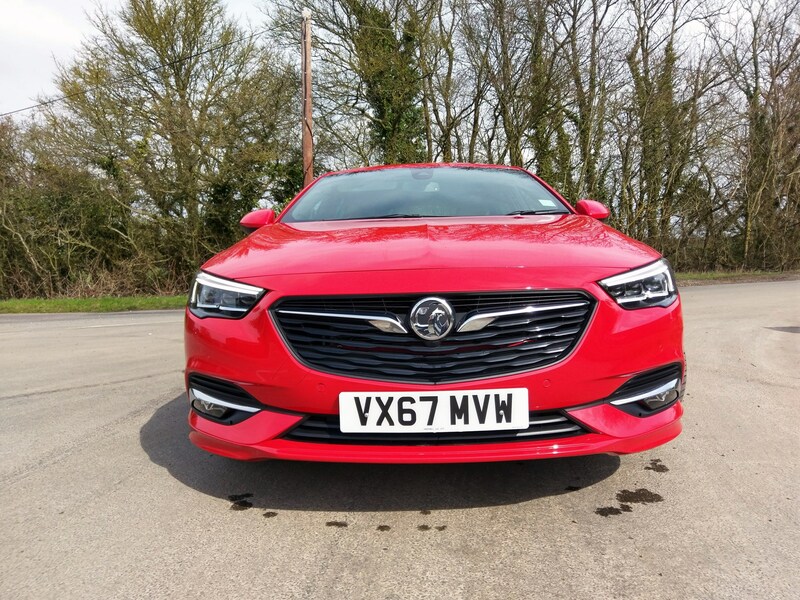 The Insignia is a far more smartly developed and user-friendly car than its predecessor, and now that I’m seeing more on the roads, I’m sure company car drivers and fleets are also recognising its strengths. Our current long-termer, the Vauxhall Insignia, is, objectively speaking, one of the best large family cars on sale today. Brimming with safety and convenience features in this SRi grade, along with a handful of desirable options, anyone driving it as their company car would want for little. But how would a company car from Vauxhall produced 40 years ago (when Fleet News was born) measure up? 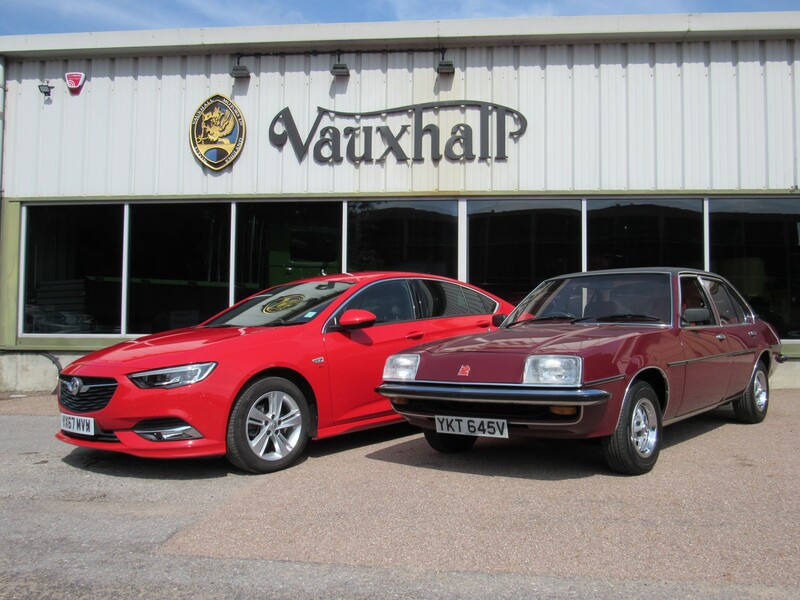 We thought it would be fun to ‘re-test’ the Vauxhall Cavalier, which was introduced in 1976, essentially a replacement for the Victor. 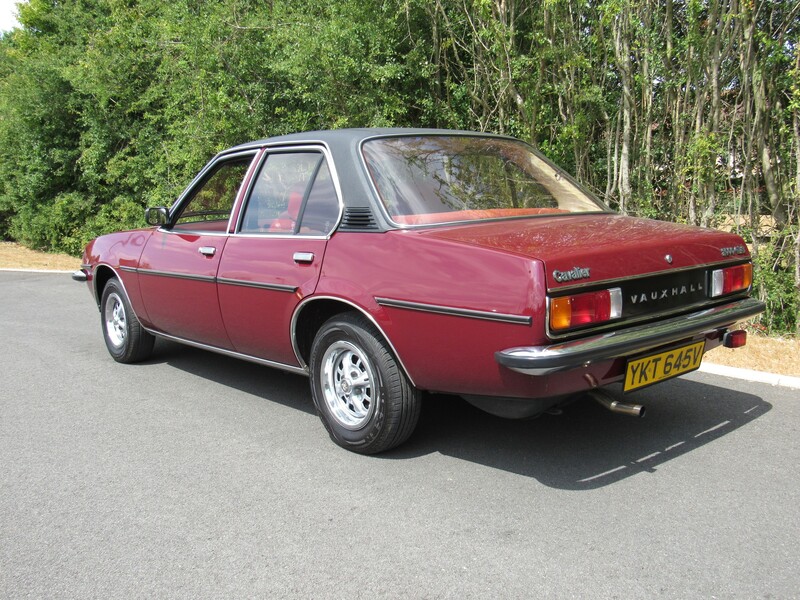 Based on the Opel Ascona, the Cavalier’s front end was taken from the Opel Manta to give it a Vauxhall identity (at the time Vauxhalls and Opels were sold alongside each other across Europe). The Cavalier was initially produced in Antwerp, Belgium. It arrived at a crucial point in the timeline of company cars. Ford’s Cortina Mk 3 was looking tired and dated, and the then recently partly-nationalised British Leyland had spent the decade in crisis. 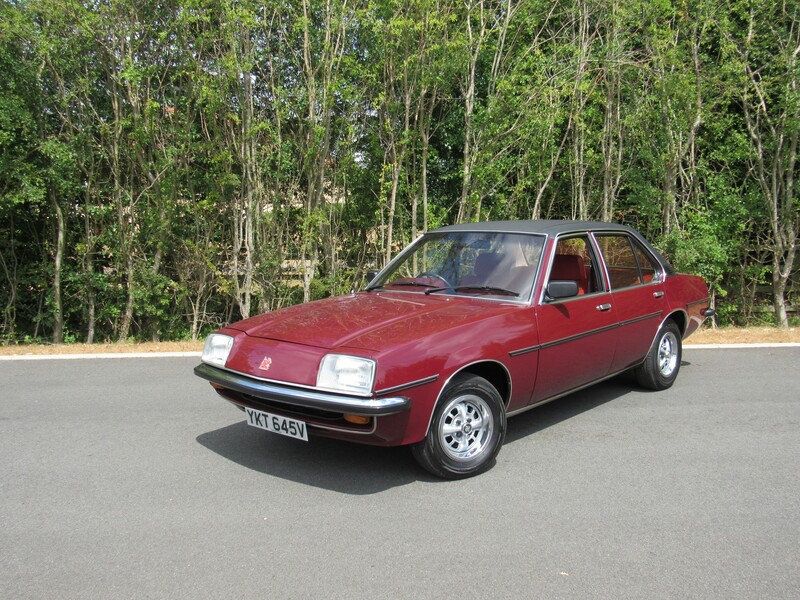 The Cavalier was an instant hit and, from 1977, production was expanded to Luton. 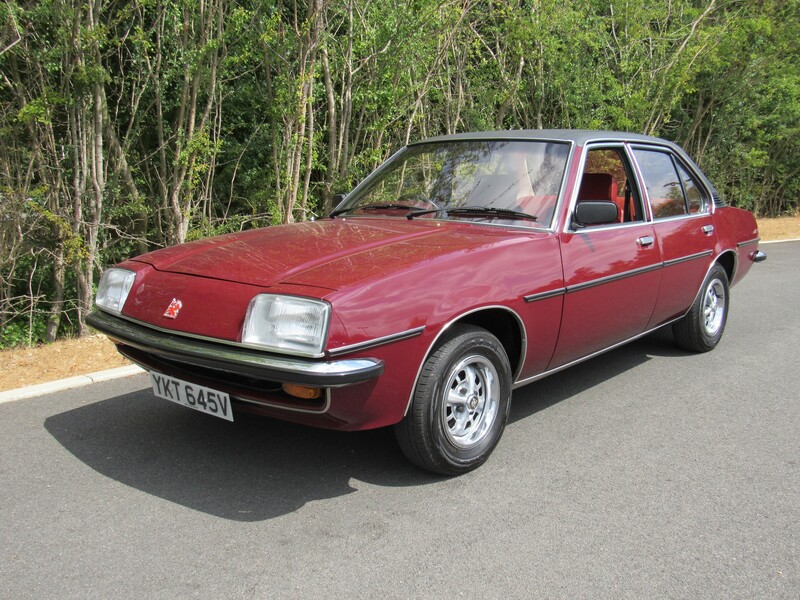 We got behind the wheel of a Luton-built 1980 Cavalier 2000 GLS saloon – effectively the range-topping engine and equipment grade combination – and this beautifully-preserved example in the Vauxhall heritage collection has just 36,000 miles on the clock. 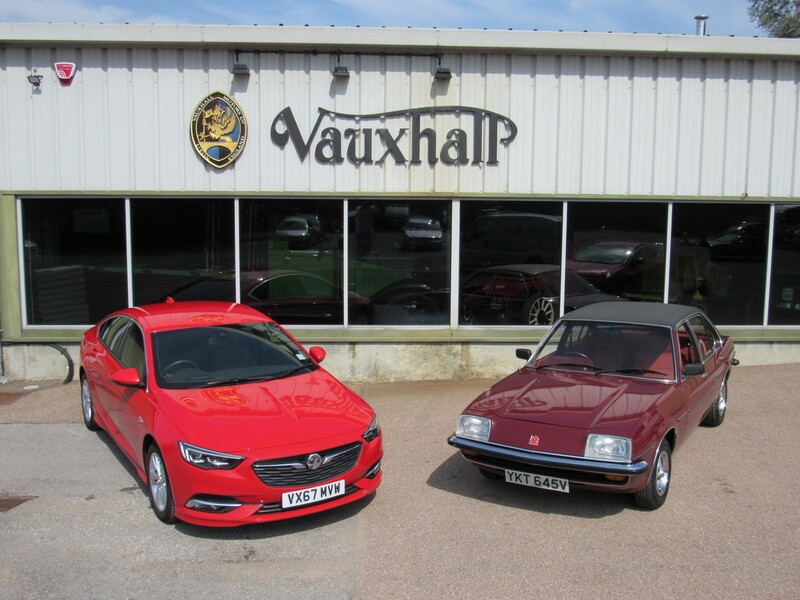 Finished in royal red paint and with a luxurious black vinyl roof, it certainly looks the part in isolation, but is dwarfed alongside the Insignia. 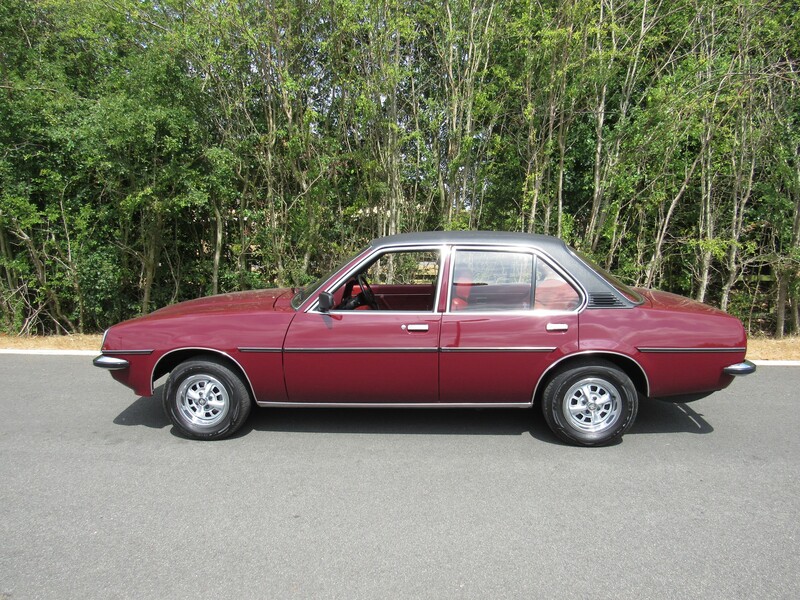 The Cavalier is 4,445mm long, 1,651mm wide and 1,384mm high, riding on 13-inch Rostyle wheels; the Insignia is 4,897mm long, 1,863mm wide and 1,455mm high with 17-inch alloys. 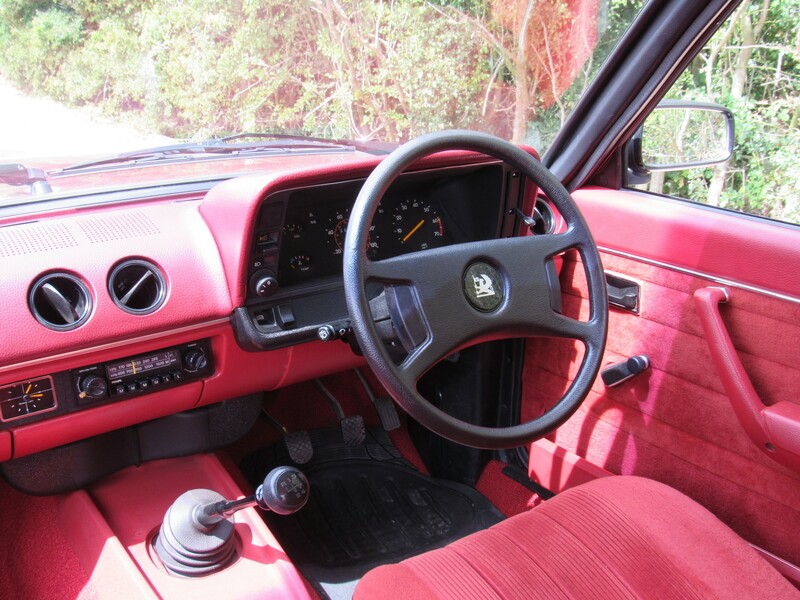 Some of the highlights of the Cavalier’s spec include a rev counter, a clock, push-button LW/MW radio, a four-spoke steering wheel, velour-covered seats and fully-upholstered doors. Its 2.0-litre engine produced 100PS which, combined with four-speed manual transmission, allowed the Cavalier to sprint from 0-60mph in 10.5 seconds. The six-speed Insignia produces 135PS and reaches 60 in 9.9 seconds with much better fuel consumption – 65.7mpg compared with the Cavalier’s meagre 28mpg. I spent around 140 miles behind the wheel of the Cavalier, and it was largely smooth and comfortable even by today’s standards. Engine refinement was good, although there was little done to suppress noise intrusion to the cabin in the 1970s. 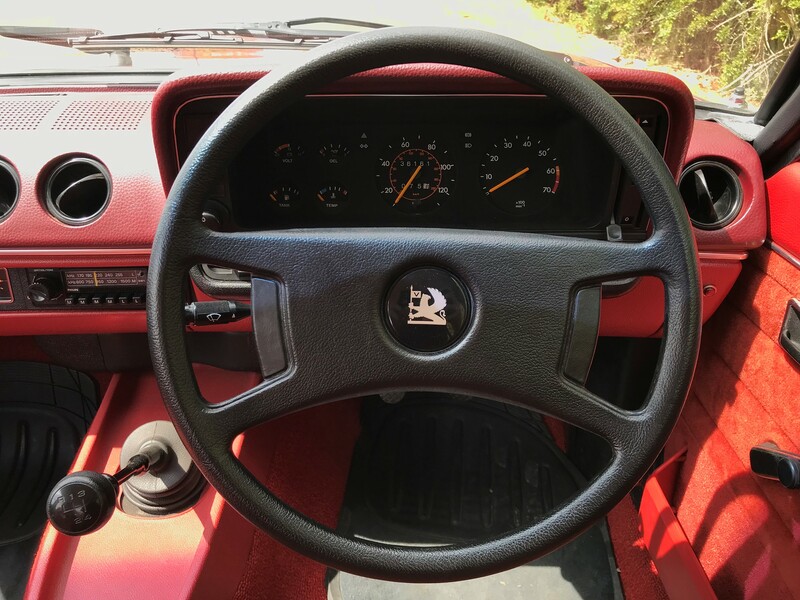 The rev counter was showing 3,000rpm plus at 60mph in top gear, which we had all forgotten about in these times of six-speed gearboxes and modern turbocharged petrol and diesel engines. No power steering makes the Cavalier harder work around town and to park. The Insignia not only has power steering, it can also steer itself into a parallel or perpendicular parking space, and while this and other convenience systems such as the head-up display, sat-nav and Wi-Fi show the march of technology across seven generations of car, the improvements in safety are mind-boggling. The Cavalier has front seatbelts and that’s pretty much all there is to say about it with regard to safety. The Insignia has sophisticated brakes with ABS, electronic stability control, and sensors that warn the driver to intervene during a collision risk, with the car applying the brakes itself as a last resort. These warning messages are repeated in the head-up display, including when a pedestrian or cyclist is detected ahead to ensure the driver has spotted them. There are airbags everywhere and seatbelts in the rear. Sensors and cameras read speed limit and other traffic signs help keep the Insignia within its lane markings and maintain a safe distance from the vehicle in front when in cruise control. Warning lights in the door mirrors alert the driver of approaching vehicles in the blindspot, while these same sensors can also warn of approaching traffic or people when reversing out of a parking space. The advance in vehicle safety features during the lifespan of Fleet News has no doubt saved the lives of many company car drivers, or at least reduced the severity of injuries. These features in the Insignia, competing in a sector of the car market that’s around 80% fleet, is doubly comforting considering Fleet News has been at the forefront of campaigning for improved safety over the years. Vauxhall may be slightly optimistic about the Insignia's fuel economy, but it would be impossible to replicate in a petrol car. The Insignia’s consistency in regularly achieving more than 60mpg cannot be over-emphasised. You may be familiar with economy runs where drivers deliberately try techniques that should deliver better fuel consumption than official figures. This ‘who can be the most frugal?’ contest is also sometimes played out at car media launches when, given we journalists are so competitive, it’s difficult to resist the temptation to deny a writer from a rival publication the glory of winning. That said, without resorting to this kind of frugal driving, the Insignia Grand Sport has still achieved impressive figures. Most of my journeys in it have been long – 100-plus miles. I travel locally occasionally, but it’s usually driven to airports or meetings. Often there is congestion on these routes, with a few miles of slow-moving traffic, so it isn’t as if the car and its 136PS diesel engine escapes the challenges of urban driving. The trip computer on the Insignia’s last tank of diesel read 72.1mpg. We know from an earlier update that the car is a little optimistic about its achievement. But measuring brim to brim, it still achieves 68.5mpg. With customers deserting diesel for a variety of reasons it’s worth pointing out that it would be impossible to achieve fuel economy like this in a similar-sized petrol car in everyday driving. And, unless every journey was short and urban-based, it would be extremely unlikely in a petrol hybrid, too. Had you taken delivery of an Insignia Grand Sport as your company car at the same time as us last spring, you would have chosen a large family hatchback with competitive CO2 emissions of 114g/km. At the time, the Insignia fell into the 24% BIK tax band. And, if it will be your company car for the next few years, your BIK tax will rise progressively, with a spike for 2018/19 because of the change in the diesel supplement from 3% to 4%. Essentially, the first year BIK tax bill for a 40% taxpayer was £2,183.53 for the car without the options fitted. However, were you to take delivery of an identical model now, you’d be facing a significantly higher tax bill. This is because the car has now been recalibrated under the new WLTP test cycle, with a correlated CO2 emissions figure. It now has emissions of 124g/km and falls into the 29% bracket for BIK. Inflation and a five percentage point higher BIK tax band as the starting point will give a 40% taxpayer a first year bill of £2,813.15 – more than £50 extra a month. Under WLTP, intended to be more reflective of real-world driving, the car now has an official fuel consumption of 60.1mpg on the combined cycle. But, during the past few days, I’ve more or less matched the old NEDC figure of 65.7mpg. This means CO2 emissions would have been more in line with the original 114g/km. The Insignia’s fuel consumption has been impressive for such a large car that never feels lacking in performance. It’s a surprise that it has been reaching the old NEDC figure, let alone bettering the more ‘realistic’ WLTP data. 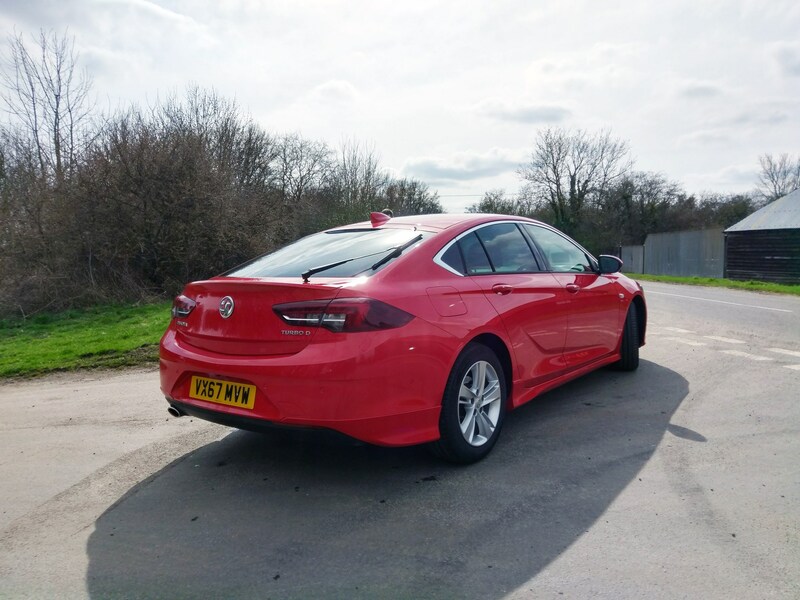 After taking the Insignia to the dealer network, Simon Harris reflects on the future of Vauxhall. It’s a long time since I’ve spent any significant time behind the wheel of a Vauxhall. It’s even longer since I had the opportunity to interact with its dealer network. 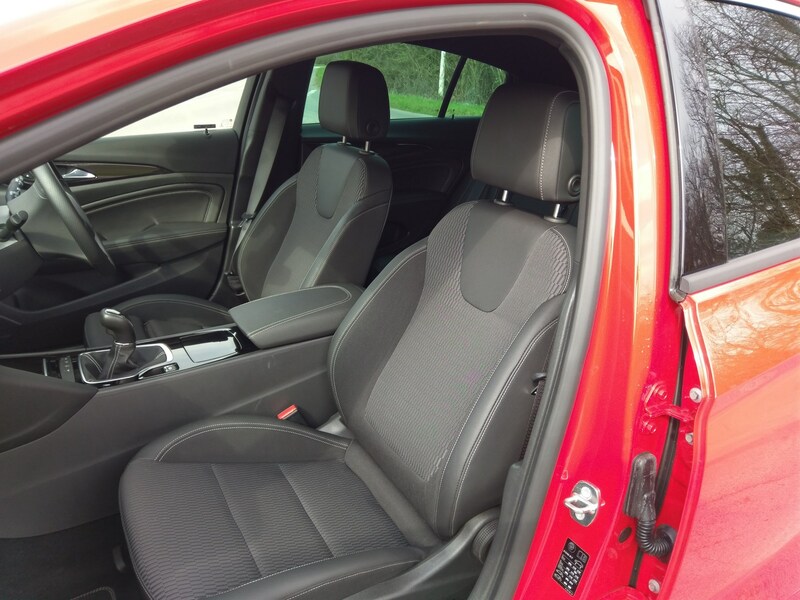 Recently we received a notice from Vauxhall that a safety check needed to be carried out on the rear seatbelts of our Insignia Grand Sport, and perhaps with claims of slow reactions over fire risks with the second-generation Zafira, the company is extra keen to ensure any problems are dealt with promptly. While Fleet News is located on the outskirts of the sprawling Peterborough metropolis, I’m based in the Lincolnshire fens. It meant that rather than using the main dealer in Peterborough, around 15 miles away, it was more convenient for me to travel just six miles to Taylor’s of Spalding. Set along a busy main road in the town, the facility feels as modern as the one in Peterborough, and the friendly service desk staff were able to accommodate me within 48 hours of my call. The work was carried out within 10 minutes, and I was on my way again with barely enough time to drink my complimentary hot chocolate. There was no problem with our car. Much has been written about Vauxhall dealers recently, with an expected downsizing of the retail network following the brand’s takeover by PSA. It was reported in April that contracts would be terminated and retailers would need to reapply to take on the franchise again. No doubt dealers will act in their best interests, but it would be a pity if the network was to lose any of its quality outlets. The Grand Sport name might be daft but the performance is very impressive, as Simon Harris reveals. There are so many new cars launched each year that it’s impossible, even for someone whose job often involves evaluating the latest vehicles, to try every one in timely fashion. So I was happy to finally get behind the wheel of the latest Vauxhall Insignia this month, and put around 700 miles on it. While the Grand Sport name is a bit of a daft alternative to hatchback, the car is, for the most part, very impressive. I was surprised that our SRi model was priced at just under £23,000 (of course, most large end-user fleets will pay much less) and by the value of some of the options fitted. For example, the head-up display is priced at £290. These displays can give cars a real premium feel. This one shows speed, traffic sign and navigation information so drivers can see the figures without taking their eyes off the road. Compare this with a premium alternative such as a BMW 3 Series, which would set you back £825. 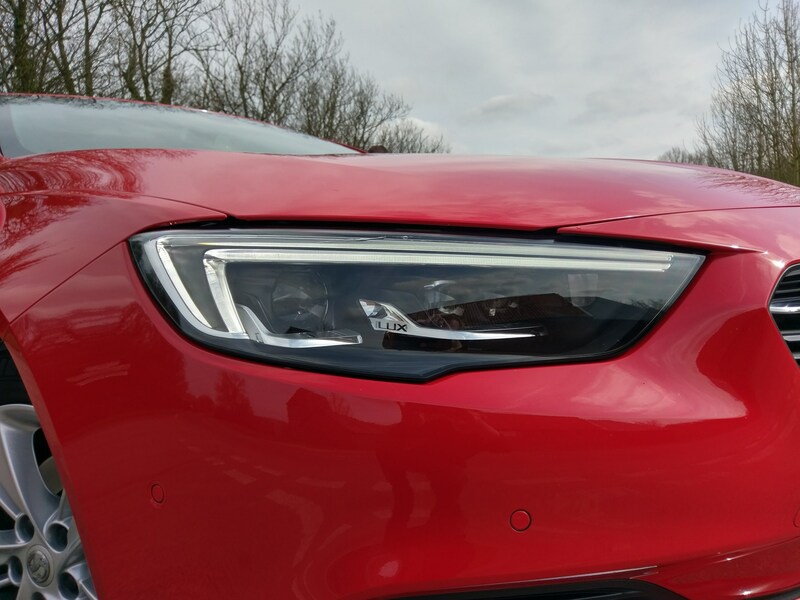 The Insignia’s sophisticated, automatically adjustable LED headlights at £1,010 are a bit steep, but priced in line with rivals, although we’d probably leave those well alone. It’s also disappointing to see car manufacturers making money out of flat paint finishes. It used to be that metallic paint, or black paint commanded a premium. On the Insignia, only Aegean blue is described as ‘solid’. Non-metallic summit white, and lava red (as on our test car), are listed in brochures as ‘brilliant’ (no more brilliant than other solid paint), and command a premium of £285. Someone please put a stop to this. Our Insignia comes equipped with Apple CarPlay which Apple calls ‘the ultimate co‑pilot’. It says: ‘CarPlay is a smarter, safer way to use your iPhone in the car. CarPlay takes the things you want to do with your iPhone while driving and puts them on your car’s built-in display. When entering the car, my phone automatically connects via Bluetooth to the Insignia in seconds. Done. But if I plug my phone in to charge, it automatically disconnects my phone from the car and activates Apple CarPlay. This, currently, can only be used by manually unlocking my phone to access its functions. It’s very frustrating. I recently received a call while driving but couldn’t answer it without finding my phone and unlocking it first which prompted me to look through my CarPlay connectivity options. It’s worth noting that drivers do have the option for CarPlay to function while the phone is locked, which might be useful for some, or to forget the connection completely and stick to the Insignia’s perfectly good Bluetooth phone connection and sat-nav which are already built in. As I don’t want to access the majority of my iPhone’s functions while on the move (and I also find CarPlay sometimes slow to react) I have chosen the later. On a recent trip, I mistakenly locked the Insignia keys in the boot and the keyless entry wouldn’t function. After a few moments of panic, I realised this was because the boot was only caught on the first latch and not fully closed. Once I had pushed it tight shut, the keyless entry was able to recognise the key was in close range and allowed the boot to open. Phew! 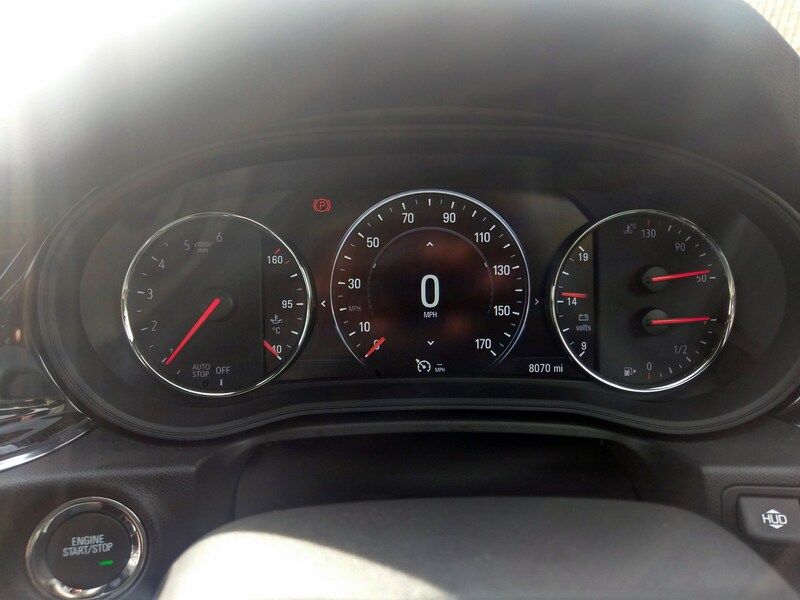 Luke Neal debates whether the Insignia's head-up-display is an important addition for business drivers in his long term review. Our Insignia is equipped with a head-up display (£290) which is optional on all Insignia Nav models with the exception of the Design trim level. It’s the first long-term vehicle I’ve driven that is fitted with one. As you are probably aware, a head-up display (sometimes known as HUD) presents data without requiring users to take their eyes off the road. It was developed for military aviation so pilot’s eyes do not need to refocus to view the outside after looking at the in-cockpit instruments. The Vauxhall display shows current speed, rpm, gear change indicator and collision warning but will also display turn-by-turn directions when navigation is in use. It feels like an important safety addition, keeping drivers’ eyes facing forward. Previously I’ve often wondered whether a head-up display is just an annoyance or distraction. Not so. In fact, quite the opposite, I find I rarely even notice the head-up display and, instead, look to the car’s conventional speedometer and navigation screen for information. However, a colleague has recently commented on how useful he finds the head-up display. Whether it’s an important addition for business drivers may well be judged on a case-by-case basis. Another important safety system included on our car is lane departure warning with lane assist. Lane departure is an impressive system which keeps the car between the white lines should you need it. If you change lanes, without indicating, the system will fight to keep you within your lane until you have crossed the white lines. It can be switched off by a dash-mounted button or overridden when the indicator is used. After two months of testing, Luke Neal has grown attached to the Vauxhall Insignia Grand Sport. I have received positive comments on its premium good looks and the 1,845 miles have seen it begin to loosen up nicely. It has an impressive turn of speed for a relatively small (1.6-litre 136PS eco tech) diesel engine and is returning a healthy average fuel consumption of 55mpg which is impressive compared to the Equa Index ‘real world’ figure of 47.9mpg but still shy of the manufacturer’s claimed 65.7mpg. On the subject of fuel (and it’s only a minor point), the fuel flap on this car is huge. I was expecting to at least find the AdBlue filler inside to justify its enormous size, but there is nothing but the fuel cap. I will have to consult the owner’s manual to locate the AdBlue filler as I haven’t been able to find any details online. 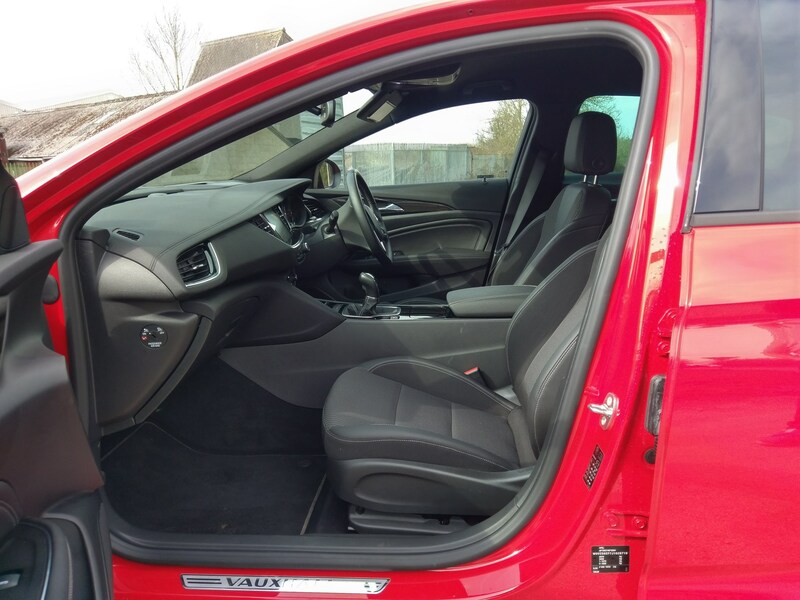 Our VX line trim car has many optional extras fitted over and above the standard and with cold weather just around the corner, I am pleased our car has the Winter Pack Four as an optional (£410) extra. The pack includes three stage-heated front seats and a heated front windscreen which, from past experiences, will be an absolute joy on frosty mornings. I have recently discovered that the heated seats can be set to automatically activate via the on-screen vehicle settings menu so I have already begun enjoying their benefits. 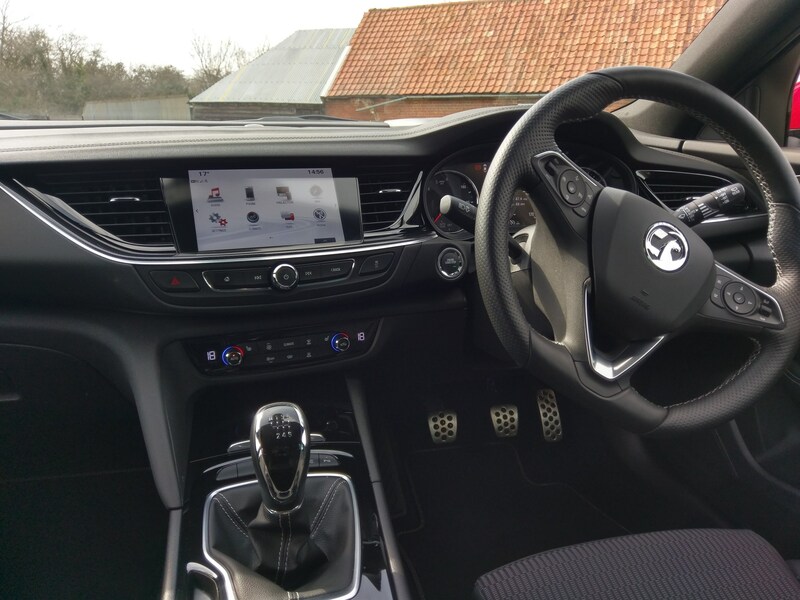 The car also has a heated flat-bottomed leather steering wheel which is part of the VX line trim rather than the Winter Pack, although it is available as an optional extra on other Insignia trim levels. The first test of the Vauxhall Insignia Grand Sport reveals it to be good looking, well specced and fuel efficient. We first drove the Insignia Grand Sport back in March. Our long term vehicle is an SRI VX Line Nav, costing £22,960 on the road. It comes well equipped with Navi 900 Intellilink system and driving assistance pack one, which consists of: forward collision alert with automatic city emergency braking, following distance indicator and lane departure warning with lane assist. It also has the VXR styling pack (sports-style front and rear bumpers, side sills and visible tailpipe) and of course, Vauxhall OnStar. We also opted for additional extras of head-up display, intelligent headlights, DAP 4, wireless charging, eight-inch instrument display, brilliant paint and winter pack four (heated front seats and windscreen) pushing the price up to £26,125. Under the bonnet is a 1.6-litre diesel engine which develops 136PS and 320Nm of torque. It isn’t the most efficient unit in the range (that’s the 1.6 110PS turbo diesel with CO2 emissions of 105g/km). But with CO2 emissions of 114g/km and combined fuel consumption of 65.7mpg it’s likely to be the best balance of performance and efficiency. Inside, the dashboard is home to two eight-inch screens, the first is the touchscreen Navi 900 intellilink display which controls the audio functions, navigation, bluetooth and vehicle settings as well as Apple Carplay and Android Auto. The second is a digital instrument display which, along with the speedometer and rev counter can be customised to display fuel economy, average speed, tyre pressure information and oil life. The interior has a premium feel, there is a good blend of leather and soft-touch materials, smart metallic detailing and ‘mood’ lighting. 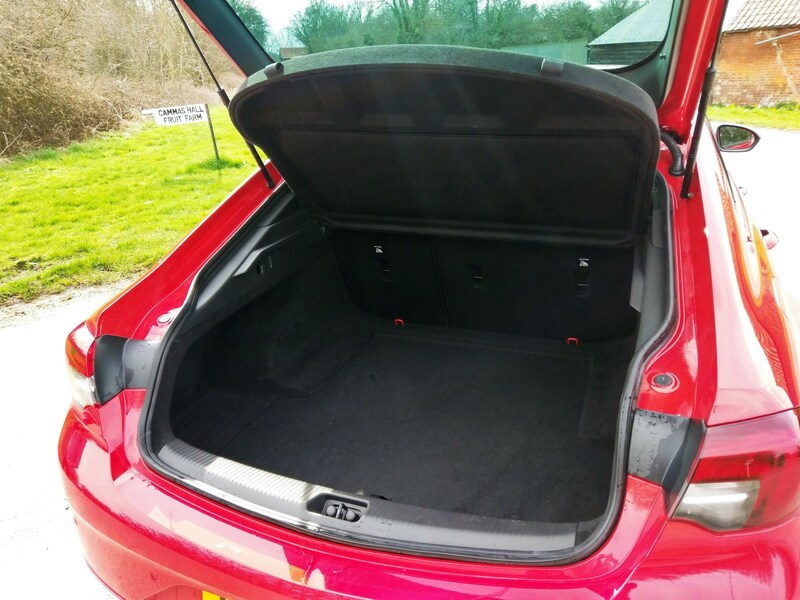 There is plenty of legroom for both front and rear seat passengers and the boot’s 490 litres feels cavernous. Economy-wise it’s returning an average 56mpg (just 10mpg below the official figure). 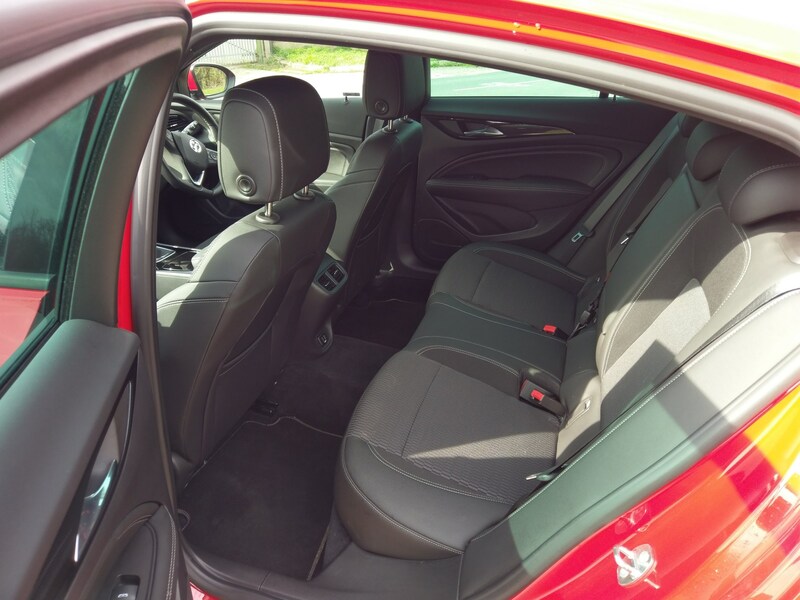 I recently purchased a brand-new Insignia Grand Sport in Rioja Red. A great looking car and a great car to drive, but from day 1 there was a water leak and the carpets are soaking wet. My situation is complicated by the fact that it was not bought locally. The selling dealer say they are aware of a fault with Insignia rear quarter window leaking. My local dealer has had it for one day so far and cannot find the source of the leak. They say they need it for a week to do a full interior strip down. I have asked for a replacement but Vauxhall are saying I need to go with the strip down, which I am not happy with. What should I do?